A new survey of lenders about innovation suggests way too many lenders think they’re crushing it in the digital disruption era. This is especially risky thinking in the eye of a disruption storm. Let’s take a look. 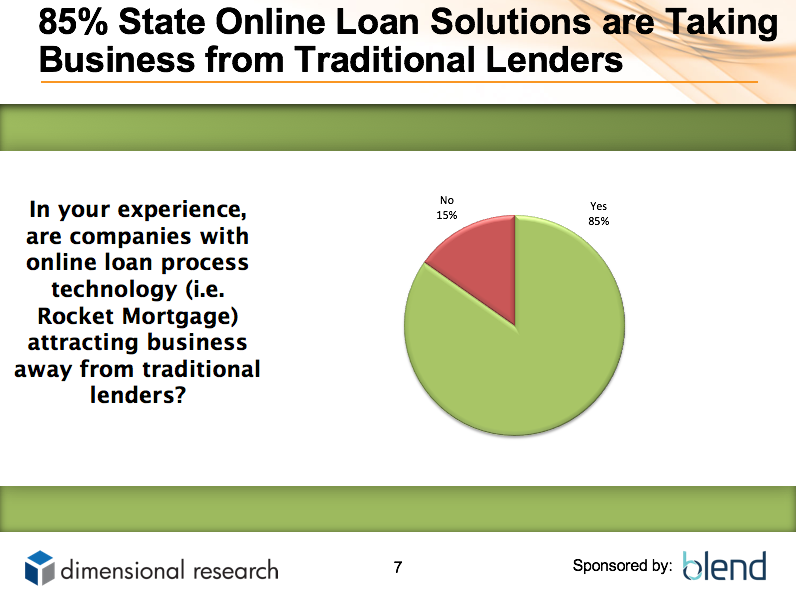 – 85% state online loan solutions are taking business from traditional lenders. 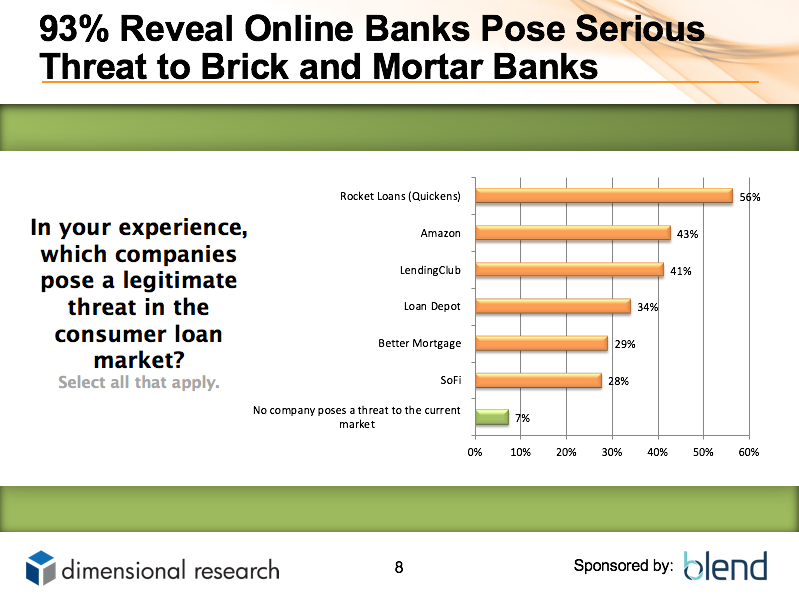 – 93% reveal online banks pose serious threat to brick and mortar banks. 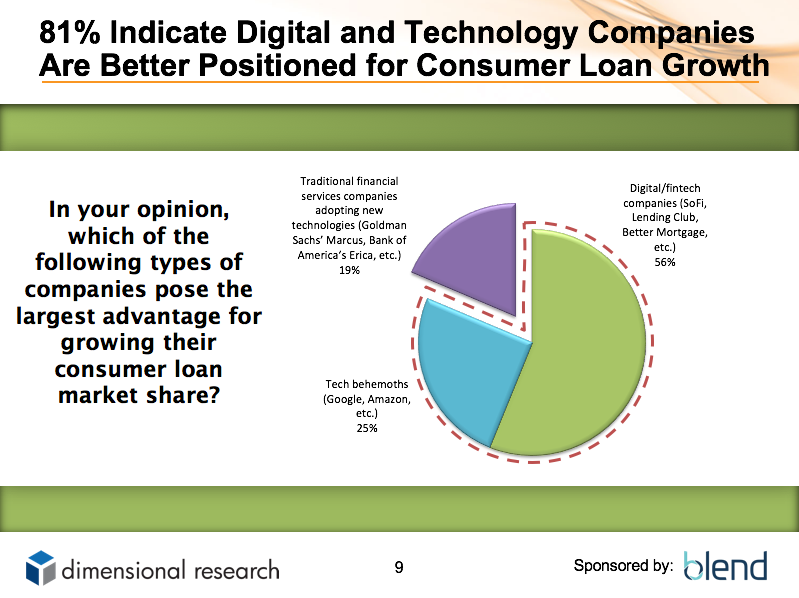 – 81% indicate digital and technology companies are better positioned for consumer loan growth. Yet this perception of competitor innovation conflicts sharply with lenders’ view of their own innovation. 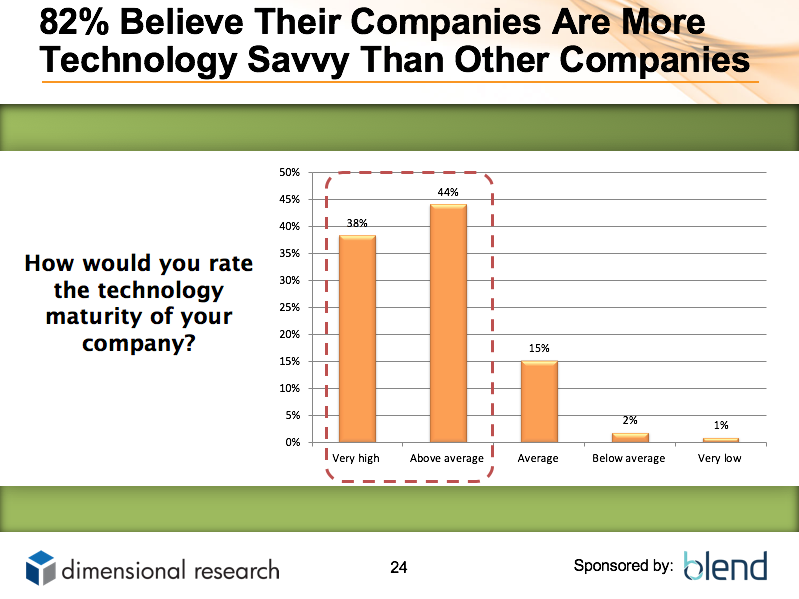 A full 82% of lenders believe their companies are more technology savvy than other companies. And the conflicts of perception don’t stop there. 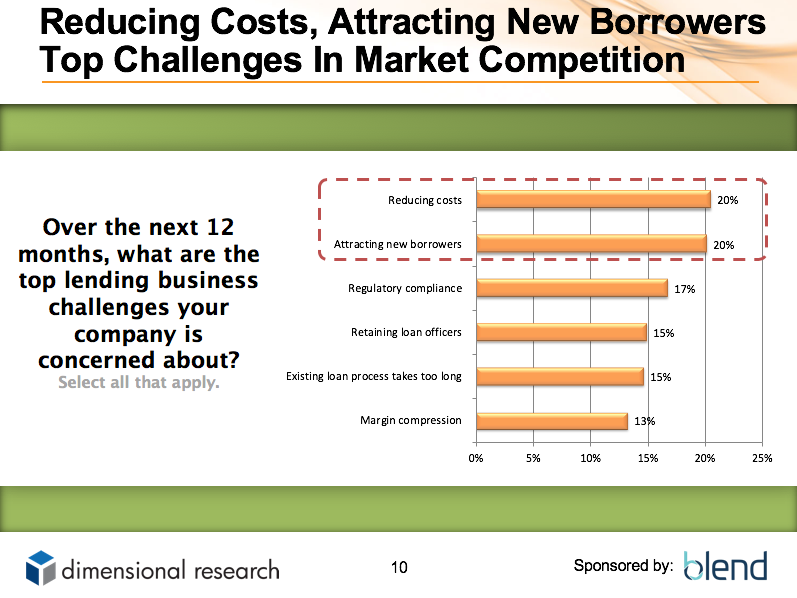 Lenders also said reducing costs and attracting new borrowers are the top challenges over the next 12 months. Fair to say cost control should always be top of mind, but attracting new customers is not a top challenge for innovation leaders. Lenders likely answered as above because their perception of innovation and digital disruption may be too limited or too reactive. According to Google, 65% of consumers look up more information online vs. a year ago, 82% of smartphone users use a search engine when looking for a local business, 82% of smartphone users consult their phones while in a store deciding what to buy, and there’s been a 29% increase in mobile conversion rates in the past year. Remember QuickenLoans’ flagship Rocket Mortgage ad for 2018 where a couple is in a lender’s office then bail mid loan consultation when they realize they can do it easier on their phone? That’s what these Google stats speak to. And remember that comment above about lenders possibly being too limited or too reactive in their view of innovation? Most lenders have been reacting to and trying to catch up with Rocket Mortgage’s loan processing technology since it launched November 2015, but haven’t yet figured out the next phase which is actually acquiring customers online. Over the years, Amazon has made people expect all retail services in one place. As this trend has matured, people now also expect this one-stop shop for other areas of their life, including home services. Why can’t you buy and sell homes as easily as you trade in your car? That question is now being answered by extremely well funded startups like Opendoor, maturing firms like loanDepot and its mello Home vision for people to buy, finance, and improve their homes, and of course the one-stop shop creator itself Amazon is now eyeing lending to add to home services they already have. This one-stop shop trend is just beginning, and it’s extremely capital intensive to focus on home buying, selling, improvement, title, escrow, insurance, and handyman services in addition to core mortgage lending. This isn’t to say that all firms must do all this to survive. But for single-product mortgage lenders, at the very least they must rethink the old model of acquiring customers mostly from realtors and past client referrals because the whole premise of one-stop shop models is based on acquiring the customer first, then sharing that customer across the ecosystem of other services. Whoever gets to the customer first wins. In the Opendoor example, they get the future borrower way early when that borrower is selling their previous home to Opendoor. And here are two more examples not noted above: Zillow and Credit Karma, with 188 million customer visits per month and 60 million subscribers respectively, both just entered into the mortgage lending business in August. They were just connecting customers to lenders, now they’ve decided if they already have the customers, they can provide lending services too. When vision starts with customer acquisition at scale like this, it provides more options for the company, and creates a better experience for the customer. The advantage incumbent lenders have is they know how to lend at scale, which is also extremely difficult. Now these lenders must adjust how they tend to think, which is ROI first, then customer acquisition, then vision. Lenders must flip vision to the front as noted in our diagram below. Innovation is supposed to be anticipatory, not reactive, and this will help lender innovation stay ahead of customer expectations—and prevent lenders from getting washed away in the disruption storm. How Do Lenders Stay Ahead of These Customer Expectations? Notable in the diagram is that profitability is the end result of operational efficiency and customer experience. Firms like Blend let lenders deliver world class customer and loan officer experience today, and as I detailed last week, the operational efficiencies are now imminent after 10 years of rising costs. 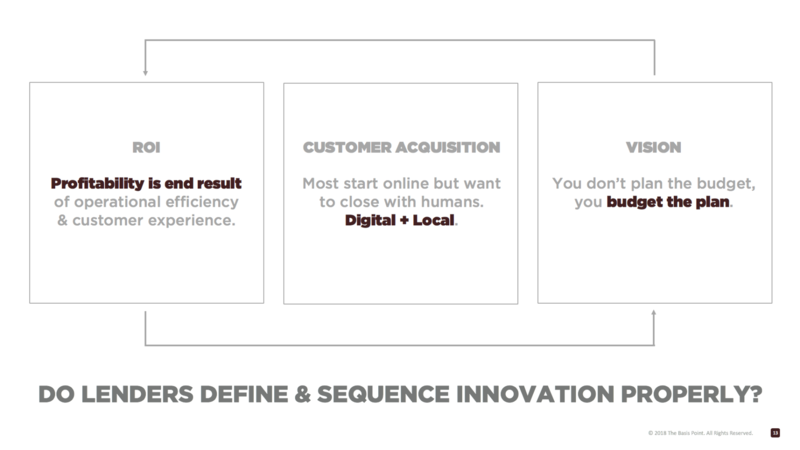 Also notable in the diagram is “Digital + Local” customer acquisition. In a mortgage market that’s 75% purchase loans, conversions of these long-lead customers is the most important thing. And according to Fannie Mae, 72% of borrowers want to run the process online and 65% still want a human to explain loan options and terms. Local loan officers will usually convert better than call centers, so the question becomes how do they originate more customers online? 1. Use local presence as an advantage. Firms like Yext can rapidly take Google results from a simple blue link in a list to extremely detailed company profiles in Google right menu. This is especially important with mobile and fast-growing use of voice search. 2. Broaden realtor referral networks to increase purchase conversion. Lenders can do this with services like Home Captain, where they can connect their pre-approved borrowers to local realtors who’ve been vetted and proven to close those borrowers faster than market averages. 3. Make marketing a revenue center like the customer acquisition masters do. To do this, you need a marketing operating system—not just a CRM–like Total Expert to put humanized automation and metrics around the process of going from lead to pre-approval to closed customer. I’ll expand on these and other strategies shortly to help lenders stay ahead of customer expectations, so please subscribe on this page, follow @thebasispoint (Twitter, Instagram), and reach out directly if you have any questions. -Survey Methodology: August 2018 survey of 350 U.S. lenders by Dimensional Research and Blend. Company size breakdown was 37% 500-1000 employees, 23% 1000-5000, 21% 50-500, 10% 5000-10,000, 9% more than 10,000. Job breakdown was 35% of survey participants were business execs, 28% IT execs, 23% business managers, 8% IT managers, 5% front line business pros, 1% front line IT pros. -Below are survey results referenced in this article.